The San Marino Recreation Department and the San Marino Chinese School offer programs for Valentine Elementary School students. We have provided below a brief description of each program. Click on the title above for each program and you will be sent directly to their website for more information and registration. 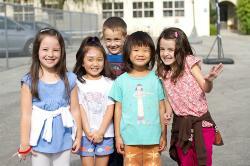 CLICK HERE: For registration information for the San Marino Chinese School Program. Day Care staff include two supervisors, an assistant supervisor and three program counselors. Transportation is provided by a certified bus company and children are accompanied by staff on the bus.The program coincides with the school calendar year. 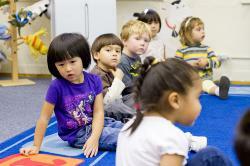 Child care services are available during minimum days and some school vacations. Registration information, you can call 626-403-2200. The Day Care classroom phone number is 626-403-2206. The Day Care cell number is 626-236-0973. This program is located in the Valentine Little Theatre opening at 7:00 AM until 8:15 AM when students are dismissed to the Valentine playground. Board games and activities provided. Cost: $140 monthly or $10 per day per child. This program is designed for children who are dismissed at 2:30 PM and need to wait for their siblings who are dismissed at 2:50 PM, or for parents who need extra time during the day. Children must be picked up at Valentine by 3:30 PM when the After School Care Bus leaves for Stoneman. Cost is $140 monthly or $10 per day per child. The After School Care Program is available from 2:30 to 6:00 PM for children in grades kindergarten through fifth grade. Students meet in the Lunch Court at dismissal each day and are transported to Stoneman. Homework time, sports, activities and crafts are part of the daily schedule. The program is assigned to Room 9 (626-403-2206) and Room 10 at the Stoneman School. Office: 626-403-2200. Daily rate is $25 per day. Payment, registration and emergency forms must be received before your child can attend. This is not a drop-in program. The office is closed on Fridays. Register by Thursday for Friday care. Students are released from school at 12:30 pm on Minimum Days. This program provides day care on all Minimum Days. Regular day care participants do not need to register for this program in addition to after school day care. The program is held at Stoneman School and is supervised by San Marino Recreation staff. Cost is $25 per day or $169 for all Minimum Days. Additional $25 if care is needed from 3-6 PM.